Crook is a village and civil parish in the South Lakeland District of the English county of Cumbria, located on the B5284 road between Kendal and Windermere. In the 2001 census the population was 340, increasing to 364 at the 2011 Census. St. Catherine's church was built in the 1880s by Stephen Shaw, a local architect, in a plain late Perpendicular style. The tower of an earlier church, built about 1620, still stands nearby: the rest of the building was demolished in 1887 owing to structural defects. A mile to the north of the village, Hollin Hall is a Grade II listed building. ^ "Civil Parish population 2011". Retrieved 24 January 2016. 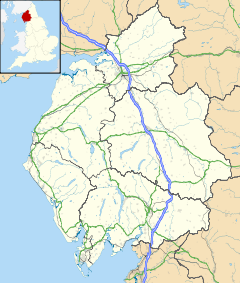 Wikimedia Commons has media related to Crook, Cumbria. This page was last edited on 1 April 2017, at 23:15 (UTC).